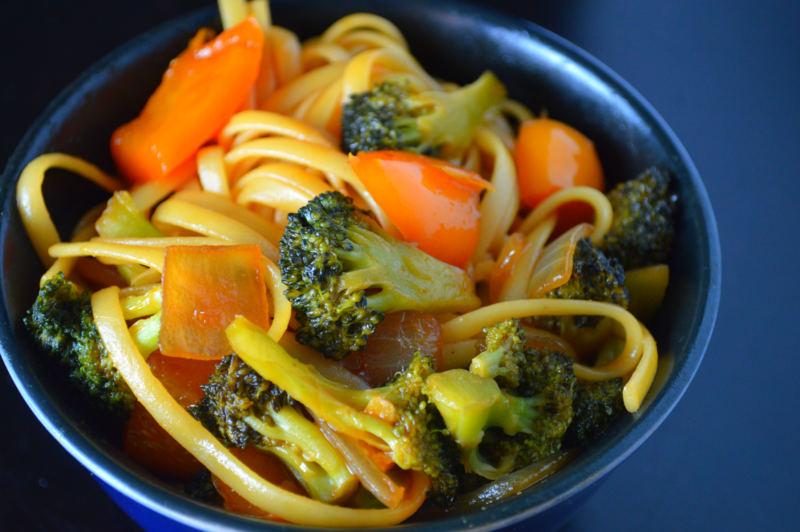 Veggie Lo Mein is the best homemade Chinese take out fake recipe I have ever made. I make Chinese take out fake out recipes often. We love fried rice, sesame chicken, beef and broccoli, orange chicken, lettuce wraps, veggie stir fry,etc. I prefer to make them at home because I can control the fat, salt, and sugar in my recipes. Healthy Chinese at home. Yes, please! My biggest tip for making Chinese food at home is to have everything ready before your begin cooking. Mix up your sauce, chop all of your veggies, and have your water boiling. Unless you have some mad Iron Chef chopping skills (kudos to you if you do) you won’t have time to chop while you go. 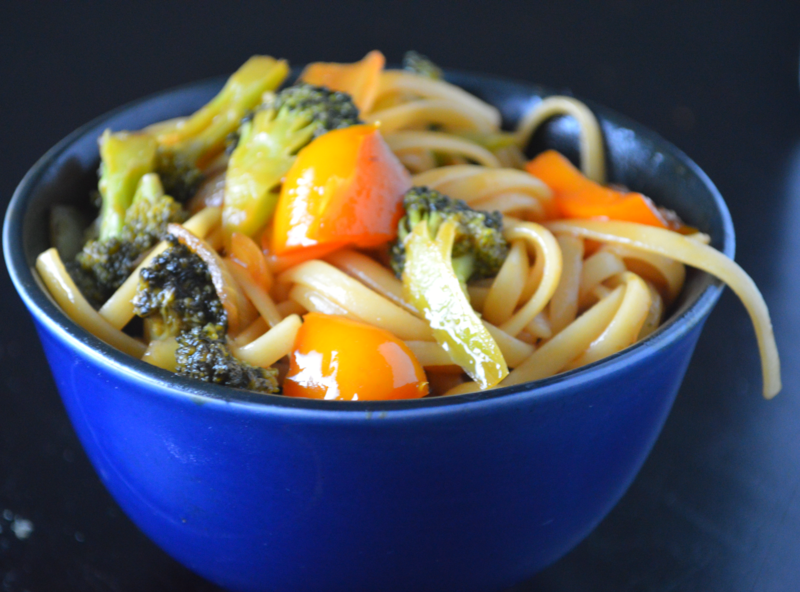 I also really like using leftover steamed or blanched broccoli in this recipe. Of course you could boil it for a couple of minutes before cooking your pasta . I use linguini for this recipe which is slightly out of the ordinary. That wasn’t really intentional. Originally, I planned on using brown rice for veggie fried rice, but realized I was all out. I was hangry and craving some Chinese food. I didn’t have any rice or soba noodles on hand, so I went with linguini. After that, I just kept using linguini or spaghetti. It works great, and I always have some Dreamfield noodles in my pantry because they are low gi healthy carbs that taste amazing. I always cook them about 2 minutes short of what is recommended on the box because al dente pasta is the best pasta. It will absorb the hot sauce and cook a little extra when everything is mixed in. If you are using regular pasta, cook it one minute less than the package instructions. Add the peppers and onions to the skillet and stir fry a couple of minutes until they are tender crisp. about 3 to 5 minutes. Then add the broccoli and garlic. Stir fry 30 seconds to a minute before adding the sauce. Bring to a boil. Add the cornstarch and let it bubble for about 5-7 minutes. When ready to serve toss the pasta in and stir around for about a minute.